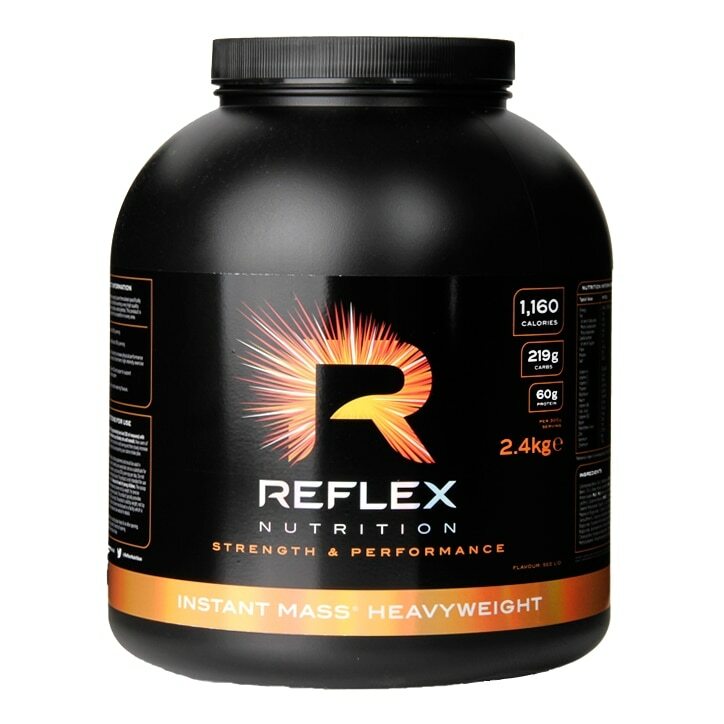 Reflex Nutrition Instant Mass is a special weight gaining formula specifically designed to maximise muscular weight gain and minimize body fat storage whilst gaining weight. Instant Mass offers maximum muscle gain with minimum fat gain. Ideal for 'hardgainers' - those who struggle to put on muscle - Instant Mass supplies adequate calories and protein to put the body in a truly anabolic, muscle building state. Each serving of Instant Mass contains a special blend containing 50 grams of complex carbohydrates from Activated Barley and Organic Oats, 52 Grams of Whey Protein and Micellar Casein. CarboBiotics Carbohydrate Blend (61%) (Maltodextrin, OAT Flour, Trehalose), High Biological Value Protein Blend (16%) (Whey Protein Concentrate (MILK), Native Whey Protein Isolate (MILK), MILK Protein Concentrate, EGG White Protein Isolate, Hydrolysed Whey Proteins (MILK), Peptide-Bonded Glutamine (WHEAT)), Creapure Creatine Monohydrate, Cocoa Powder (5%) (chocolate varieties only), Flavourings, Colour (Betanin (strawberries & cream variety only)), L-Glutamine, Magnesium Bisglycinate, Potassium Chloride (choc-peanut butter variety only), L-Choline Bitartrate, Sweetener (Acesulfame K), L-Ascorbic Acid, Bacillus Coagulans (LactoSpore), Emulsifier (SOYA Lecithin), Sweetener (Sucralose), Zinc Bisglycinate, Tocotrienol-Rich Annatto seed extract (DeltaGold - 35% total tocotrienols of which 84-92% Delta-Tocotrienols, 8-16% Gamma-Tocotrienols), Iron Bisglycinate, Nicotinamide, Copper Bisglycinate, Selenomethionine (SeleniumSeLECT), Piperine Extract (Bioperine), Retinyl Acetate, D-Calcium Pantothenate, Cholecalciferol, Riboflavin, Thiamin Hydrochloride, Pyridoxine Hydrochloride, Colour (Beta Carotene (vanilla ice cream variety only)), Chromium Picolinate, Pteroylmonoglutamic Acid, D-Biotin, Methylcobalamin, Anti-Caking Agent (Calcium Silicate). For allergens, including cereals containing gluten, see ingredients in BOLD. Reflex Instant Mass Heavyweight Powder Strawberry is rated 4.6 out of 5 by 10. Rated 5 out of 5 by CkD01 from Great I've been taking this product for 3 weeks now body shape is taking effect. Definitely recommend this product.